Their shows these days contain all the elements of a perfect performance: short, punchy songs, open ended improvisational-jams, drums & space and high-energy peaks. Todd Sheaffer’s songs are eloquent, heartfelt, and extremely meaningful - ones that will stick in your mind long after the show is finished. Songs like Bird in a House, Mighty River, Hard Livin' & Long Way to Go are all tunes that we know and love. I got to see Todd perform with his band From Good Homes, about twenty years ago, in a college gym, somewhere in northern New Jersey. I knew that Todd was destined for success and it wasn’t long after that he met the other members of Railroad Earth. 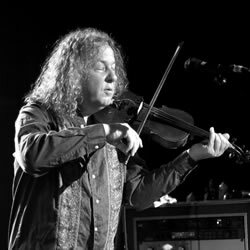 On fiddle is Tim Carbone, a master with his instrument. On some occasions he will play the electric guitar and take solos from his side of the stage. Tim is humble and a genuine figure in the community who welcomes conversation from anyone in the business. He is passionate about the musical process and has been recently hired to produce other bands’ albums. Tim’s name has been mentioned several times recently in the liner-notes of bands albums -- proof that he is a very busy man. On drums is Carey Harmon, who compliments the band with his fluid playing and great vocals. Carey can steer the ship from the back line and at any point he will break into a drum solo showing his great chops and talent. On bass and the backbone of the band is Andrew Altman who took over the position from Johnny Grubb in 2010. Altman’s playing is top notch, consistent and a great addition to the lineup. On mandolin is John Skehan who shreds with his instrument and amazing in his own right. Multi Instrumentalist Andy Goessling, plays acoustic guitar, banjo, dobro, mandolin, flute, pennywhistle, saxophones and vocals. It is a pleasure watching him on the left side of the stage lending his creative input throughout the show. There’s been a lot of talk about RRE in the last few years on the web, in blogs and in friend’s posts. It’s no wonder that RRE is embarking on multiple tours across the midwest, throughout the pacific coast and on their home turf in the east. The guys are warriors of the road and are definitely leaving their mark in history. RRE has a lifetime ahead of them and has reached success in every way. For a musician to be playing to thousands of people consistently is a tremendous feat in itself. Only the lucky few get to embrace that feeling of satisfaction and national recognition for one's hard work. After a show at the legendary Catalyst in Santa Cruz, Tim and I spent a few minutes on the tour bus talking about Railroad Earth and his extracurricular activities producing albums for other bands. I found Tim to be a musician’s musician, a guru if you will, confident in himself and in life. Tim has a strong grasp of every situation and it shows well on stage. At almost 2am, I knew my time was limited, so I kept it short and then thanked Tim graciously for his creative point of view. Tim is someone we’ll be hearing a lot about in the coming years as a performer, producer and successful figure in the jam band community. Railroad Earth came together rather quickly, what were you doing before the band formed and started playing regularly? It’s kind of a wild story because we weren’t doing anything that significant at the same time. Todd was playing some solo shows and Andy and I were in a band called Kings in Disguise. But we were slowing that down because a lot of the members couldn’t tour and we were trying to figure something else out. At first, Andy held some jam sessions at his house and people sifted in and out. By the end of 2000, the people who were left standing ended up being the principle players in the band. You have 13 shows in a row scheduled for the next month. How is tour for you, do you bounce back after a show? What is life like on the road? Touring is like something your gym teacher might have told you, “it’s not a sprint, it’s a marathon”. I love it all, but sometimes we do a lot of night drives where we play and then head out of town right after the show. We will end up rolling into a town at 9 or 10 in the morning. You may or may not be able to check into a hotel, so there is an interruption of sleep cycle. That could happen 3 or 4 times in a row and the next thing you know you are starting to feel a little off. I think you just have to roll with it. It sounds like you had your hands full over the last year working with other bands as well as touring with RRE. On the JBF website, your name is mentioned more than once in other interviews. Which bands have you been producing? I finished up a record at the beginning of 2010 with a band called White Water Ramble from Colorado. We had worked for a year and finally released it about a year ago. I was also busy working on my side project, The Contribution. And then I just finished the second album for a band out of Philadelphia called Boris Garcia. They are equal parts, Beatles, The Byrds & The Grateful Dead. Tonight, it seemed like you had all the elements of a great show: short punchy songs, open ended jams, drums & space. What else is the theory behind Railroad Earth besides being a string band with drums? Well, that is part of what we are, but we really start with the songs. Most good music starts with that. Todd is a great songwriter, so it is easy to frame his songs because they are melodic and lend themselves for this type of instrumentation and voice. You have some that are short and concise, and then there are others that we expand on and spread out. Within the show, that’s what you get: equal parts of each element and showing the audience the different faces and influences that we have. What’s planned for late spring and summer? We will do Telluride Bluegrass, Harmony Festival and some bigger festivals that haven’t been announced yet. We are very excited to be at them all. You have played with a lot of musicians in your life. But, who would you like to jam with that you have never got the chance to share the stage with? Paul McCartney, or Tom Waits and Bill Frisell. I just saw Bill in a tiny club, he only had a drummer with him doing total improvisation. There were only 60 people in a space no bigger than this Tour Bus. Yes, I remember when Bill played High Sierra and emerged on the jam scene. We all loved Bill for what he was doing. Thanks for your time Tim, it’s an honor to speak with you. Good luck in the coming year, thanks for a great show here at The Catalyst.